In the shadow of the nation's capital, Kate Livingston holds a respectable position as a government statistician when she encounters a rival from her past, the insufferable Trevor McDonough. A Harvard-trained physician, Trevor never showed the tiniest flicker of interest in Kate, and she's bewildered at the way he suddenly seeks her out. Surprising even herself, Kate agrees to Trevor's entirely unexpected and risky proposal to work side-by-side with him in his quest to rid the world of tuberculosis, a contagious and deadly disease. As Kate begins to unlock the mysteries of Trevor's past, she realizes there is much more to him than she could have imagined. His hidden depths may fascinate her, but his most closely guarded secrets and a shadowy enemy lurking in the background carry a serious threat to their future. When the truth of the past comes out, threatening to destroy everything they hold dear, how will Trevor and Kate ever overcome all that stands in their way? Customer Reviews For "With Every Breath"
I really enjoyed With Every Breath. Elizabeth Camden has created interesting characters who don't fit the norm of what is generally in romance fiction today. She did an amazing job of creating a slow but strong romance between two people who spent most of their relationship in heated contest. Trevor is a strong and mysterious hero, and his dedication and determination to find a cure for tuberculosis makes him rather magnetic. And Kate thinks so too! It's unusual for romance novels to feature a hero who won't give up his entire life for the woman he loves - and while feminists may balk at that, I found it delightfully real and authentic, and it didn't subtract from Trevor's character at all. I enjoyed the backdrop of Washington D.C. and all the quirky political and journalistic characters that came with it. You can tell Elizabeth Camden does her research well! Definitely worth reading. This book was wonderful I loved it from beginning to end. It reminded me of how thankful we must be for the wonderful pioneers in medicine that paved the way for us to have good and safe medicine to day. Those brave patient that was prepared to take unproven remedies with the hope of finding a cure, not knowing what the outcome will be. This book kept me in suspense right to the end. A must read!!! I thought everything about With Every Breath was excellent-the characters (especially the brilliant but socially awkward Trevor), the plot, and especially the writing, which was a masterful exercise in restraint in the way so much was happening beneath the text. 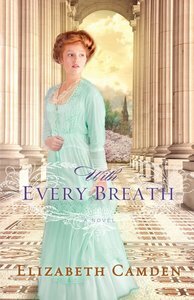 With Every Breath is Christian fiction, although the faith elements are understated. The information around tuberculosis gate a poignant and bittersweet note to With Every Breath, because I knew Dr Kendall wasn't going to discover the cure. My great-grandfather, a postman, died of pulmonary tuberculosis and exhaustion on Christmas Day 1925, and Her Daughter's Dream by Francine Rivers (and based on her family history) featured a character suffering from the disease in the early 1950's. Reading this made me thankful for the men and women like Kate and Trevor who have dedicated their lives to finding cures for horrible diseases over the years. Recommended. Thanks to Bethany House and NetGalley for providing a free ebook for review.